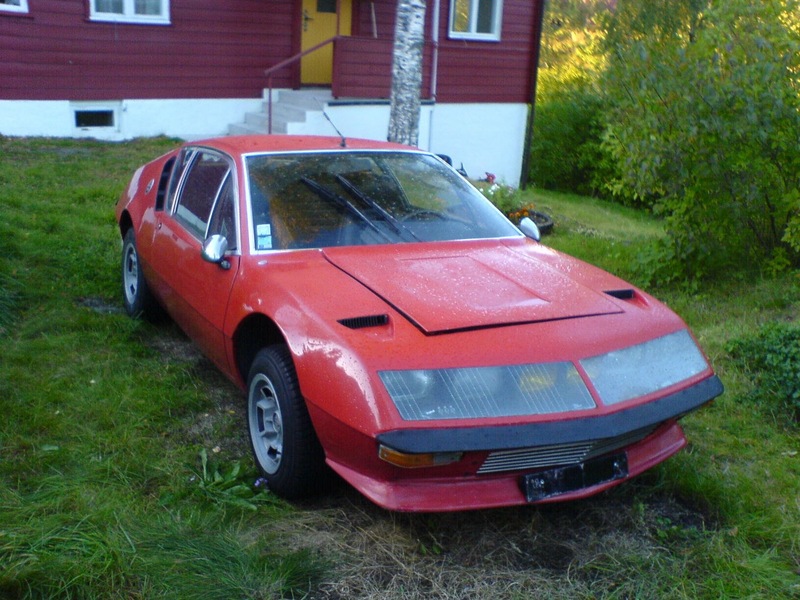 For some the Alpine A310 is an acquired taste, for others it is ‘jolie laide’ and for others again it’s just plain ugly. But when I first laid eyes on images of this car I was hooked. More recently I have been lucky enough to encounter one in the wild, and my opinion has only been affirmed. This extended CC looks at the origins of the idiosyncratic Alpine shape and the enduring existence of the A310. And with it comes a story touched by tragedy and still steeped in mystery. That Jean Rédélé’s career would be intertwined with Renault seemed somehow inevitable. His father Emile had served as a mechanic for the Renault brothers’ first ‘factory’ racing efforts, and was subsequently granted a dealership in the seaside town of Dieppe. In 1922 Jean was the firstborn to Emile and his wife Madeleine Prieur. After completing studies in business and economics in 1946, Jean found himself at Renault on a work placement program where he distinguished himself with his strategic input, catching the eye of CEO Pierre Dreyfus. As a result, he was appointed Renault’s official dealer in Dieppe. At 24, he was France’s youngest new car dealer. Jean took up competitive driving in a rear-engined Renault 4CV. After outright victory in the 1950 Dieppe Rally, he again caught the eye of Renault who put him in a race-prepped ‘1063’ 4CV for the Monte Carlo Rally where he finished fourth in class. From that point he became one of France’s most accomplished and celebrated drivers in rally and endurance events. In 1952, along with fellow driver/dealer Louis Pons, Rédélé prepared his cars with a five speed gearbox licenced from André-Georges Claude. Despite the misgivings of many, this gearbox was better able to exploit the range of the small four cylinder engine and help preserve its relatively delicate crankshaft. Rédélé also came to the conclusion that a lighter, more streamlined body would be an advantage. He travelled to Italy and engaged the emerging stylist Giovanni Michelotti. The result of this endeavour was the aluminium-bodied, moustachioed ‘Renault Special’ built by coachbuilder Allemano. It would win the first three competitions it entered and was apparently soon sold off, no doubt at a nice profit given its auspicious provenance. Towards the end of 1953, Michelotti and Allemano had delivered another little coupe to Rédélé. It was very similar to the first, although it had lost its moustache and had gained a cleaner shoulder-line and tighter greenhouse. But before it could race, a business opportunity arose for Rédélé. Renault had been approached by industrialist Zark Reed who wanted to build fibreglass 4CV-based cars for the US market. Rédélé was sounded out directly with regards a coupe, and unable to finance a share in the project, he instead licenced the shape of the second Michelotti body. The contract required a master form and so this second car itself was sent to the US, almost immediately after Rédélé had taken delivery. In 1954 Jean visited the US to discover for himself that the venture was a disaster. ‘Plasticar Inc.’ had been unable to get a handle on the fibreglass process and not one ‘Marquis’ coupe had been built. Due to the onerous shipping costs Rédélé’s beautiful little aluminium coupe would remain stateside. On his return to France, Rédélé had a third coupe made which he was intending to race and hopeful of another production opportunity. Meanwhile, Rédélé’s father-in-law – wealthy Parisian Renault dealer Charles Escoffier – had commissioned his own coupe based on the 4CV. This body was the work of French coachbuilders Chappe et Gessalin. Though not nearly as pretty as the Michelotti efforts, the carrosserie had successfully built their little coupe in fibreglass. Under familial pressure, Rédélé gave up on his little Michelotti and instead joined Escoffier in a venture formalised as ‘Société des Automobiles Alpine’ on 6 July 1955. Two years earlier, Sunbeam had also named one of their cars ‘Alpine’, a complication that would confound the French company as it came to expand its market internationally. 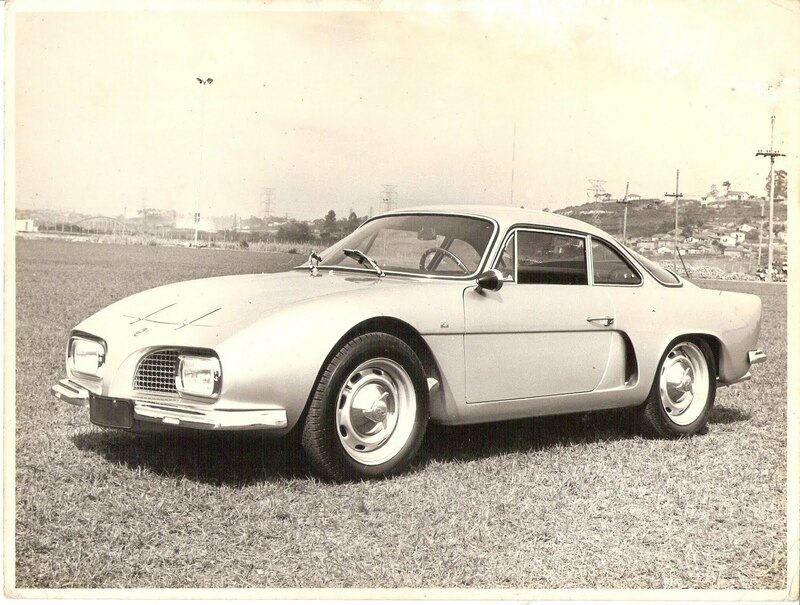 A few days after the joint venture was signed, and just before the July 14 Independence Day celebrations, the first three examples of the Alpine A106 were presented in the courtyard of Renault’s Boulogne Billancourt headquarters, proudly rendered in the French tricouleurs. Pierre Dreyfus was most impressed with the display. The A106 would not only prove itself in competition, this new company would go on to produce 251 examples of the model. By the mid-1950s, plans were afoot for a new Renault model to be known as the Dauphine. This car was to be larger than the 4CV, in engine and in body. It was also intended for a two-door model to complement the four-door saloon in the Renault lineup. This might have been taken as a direct competitor to the Alpine, but what would emerge was ultimately a small boulevardier rather than a performance car. Jean Rédélé was asked to help Renault as they developed this little coupe/cabriolet. Some in-house ideas had been prepared before Renault looked to the Italian carrozzerie for suggestions. 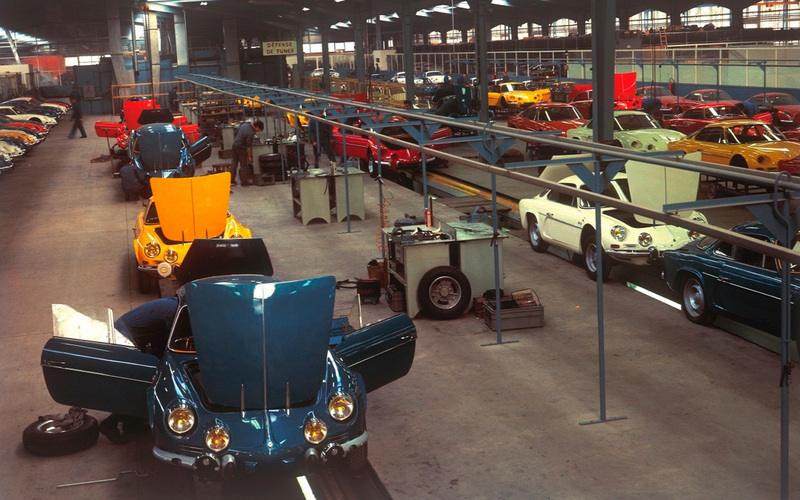 Ghia was the strong favourite, and their first effort built by Frua (bottom left) would eventually become the Renault Floride – though not without its own complications. Michelotti had also been asked to submit a proposal (bottom right), but it was rejected for a number of reasons including that the brief had been changed to a four-seater. Despite the fact that the Michelotti car was not favoured, Rédélé rather sneakily ordered a two-seater cabriolet prototype from Michelotti/Allemano based on the coupe as the Renault project progressed. Coincidently (or not), Chappe et Gessalin had prepared an ungainly cabriolet for Alpine around the same time which was shown to the public. In 1957 Rédélé asked Michelotti for another coupe which was delivered in 1958, though it’s not clear whether this was intended as a Renault or Alpine proposal. It would be Jean Rédélé’s last commission for Giovanni Michelotti. Rédélé had been chafing at his lack of independence within Alpine, and with the cabriolet project he was finally able to get his own way on the matter. Instead of the Chappe et Gessalin proposal, the Michelotti Renault prototype somehow found itself announced as the next new model in the Alpine range. Though these images are not in strict chronological order, we can see how the shape of the Alpine two-seater cars moved towards their most iconic iteration as the A106 and Dauphine-based A108 models overlapped. Early coupes were very similar to the first Michelotti Dauphine proposal. 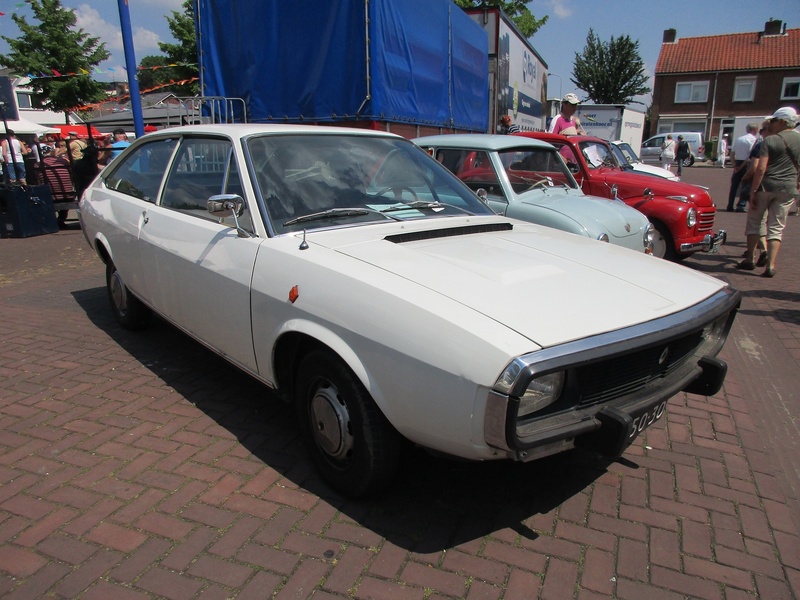 Quite soon, the shape received faired headlights as had been seen on the 1958 Michelotti coupe. A fast-back shape then became greenhouse of the body now known as the Berlinette. Rédélé would later insist that Michelotti was not involved with this emerging Berlinette shape, and he was technically correct. The faired headlights and new greenhouse were the efforts of in-house staffers Phillippe Charles and Marcel Hubert, and the final touch of revising the rear end late in the A108’s life was the work of Serge Zuliani. It is probably disingenuous, however, to deny Michelotti’s influence on these shapes. The development of these models was under the aegis of Rédélé’s cousin, Roger Prieur (left). Prieur was a significant member of the Alpine team and would be responsible for the manufacture of the production cars, built in a factory on the Avenue Pasteur in Dieppe behind the dealership of his brother Jacques Prieur (centre). It was Roger Prieur who devised the masterstroke configuration of Alpines to be used for the next 35 years. In 1960, the donor Renault platform of the A108 was replaced with a backbone frame (seen here on the A110 1300S). Hans Ledwinka had conceived the backbone frame nearly fifty years prior and first used it in his 1921 Tatra T11. It allowed for greater resistance to torsional twist, and for half axles to better maintain contact with uneven ground – an added bonus for Alpine’s rally applications. Though Prieur’s use of the backbone differed in that the central tube did not carry a driveshaft, it predated Colin Chapman’s efforts with the Lotus Elan by at least two years. If Alpine had edged slightly ahead of the fibreglass-bodied Lotus, it was still lagging behind the rear-engined Porsche. Rédélé always had one eye on the German marque and he would constantly use it as a benchmark for his own models. Alongside the performance capabilities of the four-cylinder Porsche was the fact that the most popular models in the range were four-seaters – an element that played into greater sales volumes. In 1963 Porsche upped the ante, announcing a new six-cylinder engine wrapped in an attractive new body. Alpine had its own four-seaters running parallel with the two-seater Berlinette and cabriolet. The A108 2+2 (top) and A110 GT4 were Chappe et Gessalin shapes. They were not great sellers – only 100 of the GT4 were produced – due in no small part to their lacking in aesthetic virtues. However they did broaden Alpine’s range and would come to be directly replaced by the A310. The 1962-launched Alpine A110 Berlinette is deserving of its own comprehensive CC. Its distinctive silhouette was like no other, and it also excelled as a performance vehicle. In competition, this model would score countless wins and a multitude of national and international championship titles over its lengthy production life. 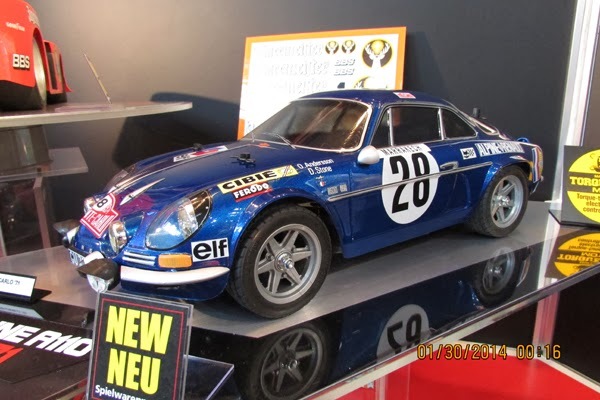 Whereas the previous Alpine models had sold in the hundreds, over 7,500 examples of the A110 would be produced. Rédélé’s global ambitions resulted in thousands of licence-built A110 models from Interlagos in Brazil, FASA in Spain, Dinalpin in Mexico as well as 50 examples of the Bulgaralpine produced in Bulgaria. By 1957 Jean Rédélé had hung up his own helmet, but competition was a still crucial facet of the Alpine experience. 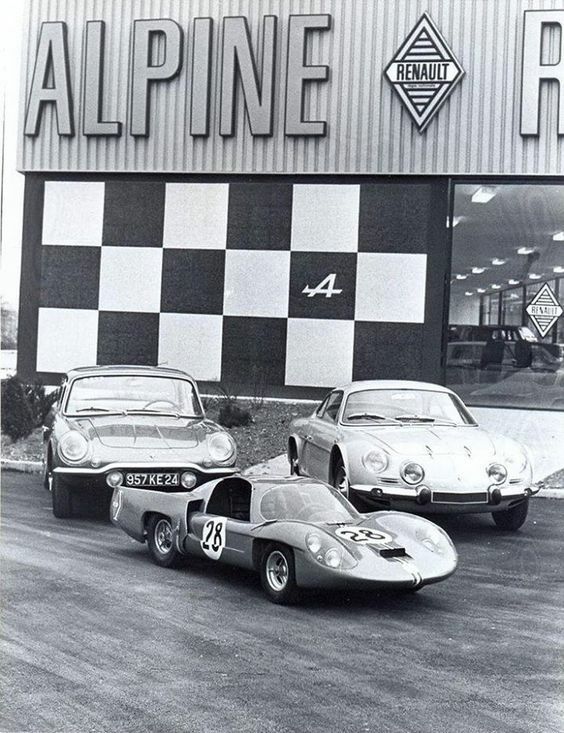 Emboldened by their burgeoning success, starting in 1963 Alpine entered the sports prototype field with the M63 (above), M64 and M65 in their respective years. These streamlined shapes were the work of aerodynamicist Marcel Hubert and the wind-tunnel, and were powered by engines developed by the legendary Amédée Gordini – whose breathed-upon Renault mills had also been optional for Alpine road cars since 1957. 1964 saw success in the single-seater field. With help from Brabham’s Ron Tauranac and shaping by Hubert, Alpine had entered the Formula 3 category and found their car carrying that year’s French Champion, a feat equalled in 1971 and 1972 and also surpassed in 1972 with the team’s European Championship. In 1966, an A210 won the Index of Thermal Efficiency at Le Mans and four of the Alpine prototypes entered covered a combined distance of over 4,000 km – greater than any other French manufacturer had accomplished at Sarthe. From 1967, Renault’s racing efforts were officially represented by Alpine. That same year the road cars were badged ‘Alpine Renault’ and were now available through the authorised Renault dealer network. 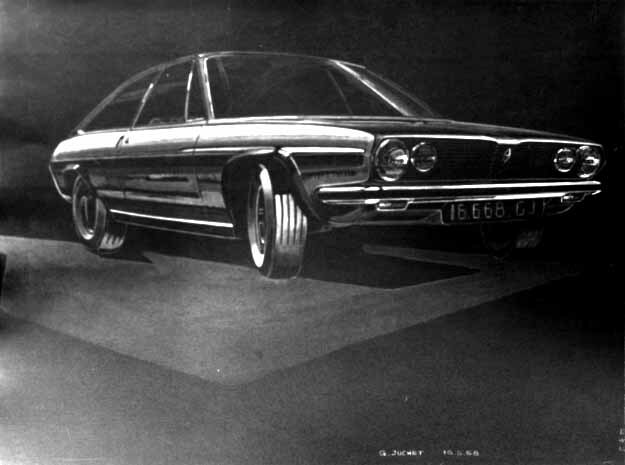 1967 also saw the introduction of the A211 sports prototype. It featured a new 3 litre V8 engine by Amédée Gordini and finished four of its five entries but earned no podiums. Further development as the A220 in 1968 (above) and 1969 fared no better, proving unreliable due to excessive vibration. The 3 litre V8 was the combined effort of the Gordini (right), Rédélé and Renault to raise their collective game and compete at the ultimate levels including Formula One. In 1967, however, a much needed 6 million franc government loan was instead handed to Matra, leaving this trio to continue their efforts on their own. The engine’s 310 hp output was no match for the 400+ hp of the Cosworth engines, so instead this V8 was used in the ill-fated Le Mans prototypes. It was also anticipated to put it in a completely new Alpine road car. Backtracking a little to the mid 1960s, the RAG project (Renault Alpine Gordini) was to be another example of this strengthening of bonds between the three parties, though there’s not much information available on this two-seater, front-engined, steel-bodied (I think) car. The little that is known about the RAG project is that it was to be based on the 1965-released Renault R16 and featured the four-cylinder engine used in that family car in Gordini-developed form. Though there are genuine questions over the Citroen origins of the R16 hatchback configuration, its distinctive Renault shape was the work of Gaston Juchet. Juchet had joined Renault in 1958 as an aerodynamics engineer and by 1962 had established himself as one of their stylists. 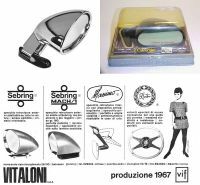 He was head of styling from 1965 to 1975, and continued with Renault when Robert Opron took the head job, perhaps relieved to cede the administrative tasks and focus on design. Nevertheless, he was again made head of styling at Renault from 1984 to 1987 upon Opron’s departure. He appears to have been a self-effacing and modest figure in the ego-driven world of the automotive stylist. The RAG coupe’s shape had sprung directly from Juchet’s hand, and a full size prototype was constructed before the project was abruptly cancelled in 1966. Juchet was then tasked with a clean-sheet approach for what would become the Renault R15 and R17 – a two-door four-seat specification based on mechanicals from the incoming R12 saloon. 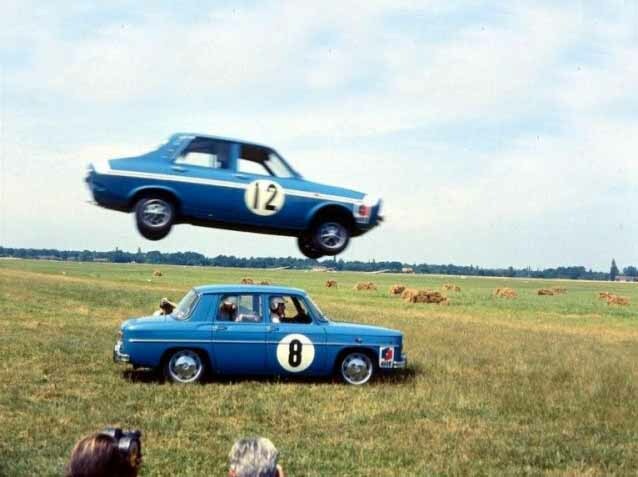 Meanwhile, Alpine redirected their focus to a road car using the 3 litre V8 Gordini engine. Renault stylist Michel Béligond was seconded to Alpine in Dieppe to help with this new model. That’s him standing at left in this publicity still for Renault featuring R16 scale models. Interestingly, Juchet – who was overwhelmingly the primary stylist on the R16 – is not featured here, perhaps as a result of his own modesty, of Béligond’s photogenic presence, or of both. Béligond had already indirectly made his way into the French psyche. After the tragic circumstances of the 1955 24 Heures du Mans when 83 spectators had been killed, Béligond was commissioned to apply a softer, less combative and more celebratory tone into their famed posters – a task he accomplished into the early 1960s. He had started as a cartoonist at Simca and then made his way to Renault in the early 1960s. Beyond this, there’s not much information on his styling career, though his presence was definitely felt when one of his sketches for the 114 project (above) reached the full-size prototype stage at Renault. Sometime around 1967, Michel Béligond joined Jean Rédélé and Roger Prieur in Dieppe, and they started working together on the new Alpine model at Rédélé’s kitchen table. These sketches are taken from a French news piece on Béligond and the Alpine A310. Though they may not all be directly related to that project, I have arranged them as a demonstration of how the shape might have progressed. By early 1968, the team had settled on a general styling configuration for this rear-engined car. It incorporated broad fully-volumed ‘c-pillars’ running cleanly and completely into the body as no automotive shape had applied them before. However, Michel Béligond had multiple sclerosis. When exactly it was diagnosed is not clear. Accounts describe his condition during the development of the new Alpine as one of increasing paralysis before he was to die in 1973. How devastating it must have been for this man – whose delicacy of touch went to the very essence of his character – see his facility ebb away just as he was in the midst of perhaps the most exciting project of his career. A young stylist, Yves Legal, was employed by Alpine to assist Béligond in the face of his declining condition. Legal apparently took Béligond’s rounded shapes and made them sharper, with more crisply defined junctures and surfaces. It was also around the time of this stylistic transition that the decision must have been made to exchange the problematic 3 litre V8 with a four-cylinder engine. And with this tragedy comes mystery. The form arrived at by Alpine in 1968 bore a marked resemblance to the 1970 Monteverdi Hai. This appears to be more than a coincidence. Peter Monteverdi was a Swiss car dealer who had been selling Ferraris and dabbling in his own short-run productions of small racing and passenger cars. In 1967, he expanded his ambitions with a large two-seater front-engined coupe powered by the 426 Hemi. He engaged Frua to style the car and ordered 50 bodies to be made. When he upped his order to 100 examples, Frua was unable to commit to the revised volume and Monteverdi instead contracted another carrozzeria, Fissore, to build the cars. He had refused to pay Frua a design royalty for the examples being built by Fissore, and Frua took him to court. The court found in Frua’s favour and ordered Monteverdi to pay. The mid-rear engined Monteverdi Hai 450 SS arrived in the wake of the Lamborghini Miura and was first shown in 1970. The prototype had been built by Fissore, but Monteverdi claimed that he himself had come up with the shape. But by the early 1970s, another stylist had stepped up to claim the Hai’s shape – Trevor Fiore. Until his death in 1998, Monteverdi would never acknowledge Fiore’s role, and had in fact originally registered himself as the designer of the Hai’s shape, probably mindful of the ‘issues’ that had arisen with Frua. This is Fiore working on yet another similar shape – the Gilbern G11 – in the late 1960s with assistant Jim English. Fiore was an English-born stylist who changed his surname – ‘Frost’ – to that of his mother – the italianate ‘Fiore’. 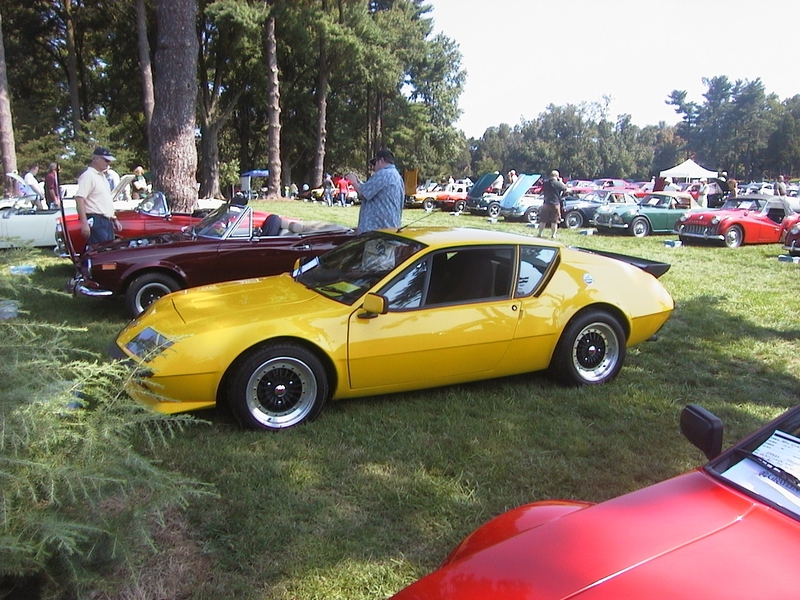 As time has progressed, Fiore has been credited with both the Monteverdi Hai and Alpine A310 shapes. Though there seems to be no conclusive proof of his authorship of the two continental models, the similarity across these three forms is marked. Fiore’s place in the annals of automotive styling was firmed with his 1965-66 TVR Trident. This was one of the first origami wedge shapes to define a cohesive and balanced form. Though it would lead a troubled life due to chronic underfunding in its various production opportunities, the Trident influenced – amongst others – Colin Chapman to pursue this vernacular for his own cars. It had been based on his 1962 proposal for Lea Francis (bottom left), and his 1966 Bond Equipe 2 litre GT (with in-house detailing by Bond) was another example of this Fiore language. Though the Trident was publicised as a Fissore creation, it appears that Fiore might not have actually been an employee of the carrozzeria, but rather a freelancer. From my understanding, he was preparing designs such as the Trident on his own initiative, then was trying to get an order from a manufacturer which could then be met by Fissore’s own production capacity. Of note is the use of Fiore’s own logo on the brown sketch, rather than that of Fissore. To return to the Monteverdi Hai; it is said that on a visit to Fissore Peter Monteverdi had seen Fiore’s work on the Alpine and insisted on using that shape for his own car. His orders brought in substantial income for this small Italian carrozzeria, and it was likely this financial heft that allowed him to get his way on the matter. And to eventually ensnare for himself a share in ownership of Fissore. But that still doesn’t answer how Trevor Fiore came to be working on the A310 in the first place. Carrozzeria Fissore appears to have had no commercial arrangement at all with Alpine or Renault, neither before nor after this time. In fact it was another Italian carrozzeria, Coggiola, who was engaged by Renault to build the functioning prototype of the finalised A310 shape. If Coggiola had been engaged by Renault or Alpine to help with styling during the ‘soft-form’ phase of the A310 in early 1968, it still takes us further away from the explanation as to how this soft form version came to be so close to the Monteverdi Hai. Based on what little I can unearth, one possible explanation is that Fiore was directly and discretely engaged to work as an independent freelancer on the Alpine project once Béligond’s condition surfaced. It was during this period that he, Béligond, or the both of them together came to the early 1968 shape in Dieppe. Using Fissore as a ‘home base’, Fiore might have returned now and again with some of the sketches, which were then left inadvertently lying around when Peter Monteverdi decided they would suit his own purposes. 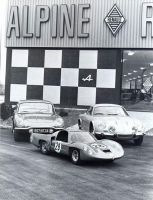 Yves Legal was then hired by Alpine on a fulltime basis, and as the top image suggests (with A110s in the background), the refinement of the shape took place in Dieppe and not in Italy. Fiore continued to contribute right through to the preparation of the final prototype at Coggiola. I must stress that these suggestions are at best tentative. However I can’t put any more logical explanation to events than this. As the top image by ‘Manfred’ at Forum Alpine Renault shows, the car was to receive an underbody shroud. Aerodynamicist Marcel Hubert (bottom right) had been hired by Rédélé in 1962 primarily to work on their racing efforts starting with the M63, and would continue with the marque until 1982 as a crucial member of the team. He was also involved in the development of the road cars, though it appears his influence on the A310 was one of refining rather than defining. 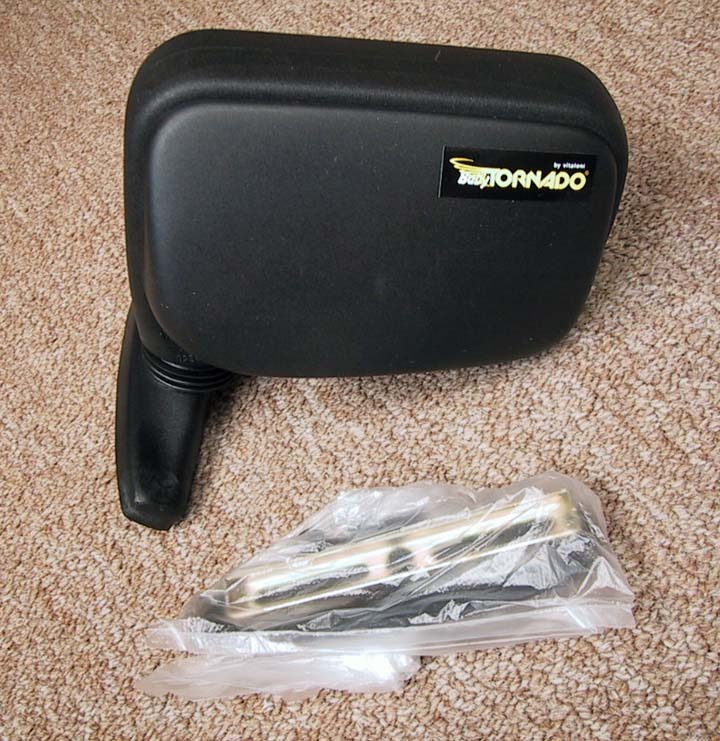 The final piece of the puzzle is the frontal treatment of the car. This sketch from either 1970 or 1971 is signed ‘Gaston Juchet A310 Style Béligond’. It appears to be a general impression of the car once all elements of the shape had been finalised and before being committed to construction of the prototype. That distinctive front end had not appeared on any A310 drawings or models prior to the Juchet sketch. And when I consider these earlier Juchet pieces, the coupe at top rendered in 1969 and the van beneath in 1970, it appears that this crucial final addition to the Alpine was the direct contribution of Gaston Juchet himself. A significant contribution made quietly in deference to the ailing Béligond, perhaps. And so yet another French automotive spacecraft landed on planet earth. The silver Alpine A310 prototype was first shown at the Geneva Motor Show in March 1971. Before delivery commenced on production models that October, there was a final change to the body; the rear lights that sat above the bumper under flush plexiglas panels on the prototype were relocated and replaced with a cluster of blister units. It was a masterful shape, drawing much from the prevailing origami language. But it also managed to temper the extreme nature of that language’s sharp creasing with an adroit use of curvature and faceting – sometimes flowing into each other and other times more punctuated. The rear really demonstrates this and is helped in no small measure by the lack of seams on the one piece body. It was prismatic where the A110 was aquaceous, but was unmistakeably an Alpine. As with the creations out of Stuttgart, its proportioning is not compromised by the rear engine location but actually enhanced by the successfully-met challenge it presented its authors. The c-pillars are admittedly a handicap for the driver’s field of vision, but the shape is not entirely impractical. Its unconventional handsomeness wins me over. The A310 received the same backbone chassis as the A110, although it had wishbone and coilover suspension on all corners compared with the A110’s swing-arm rear. The front suspension towers were taller than those on the A110 as the coils were mounted to the top of the wishbone. Steering was rack and pinion (2.5 turns lock to lock) and braking was discs all round. The fibreglass body was bolted to the chassis and the car’s dimensions were 164.5” (4,180mm) long and 63.8” (1,620mm) wide. The wheelbase was the same as outgoing GT4 (and recently lengthened Porsche 911) at 89.4” (2,270mm), although the Alpine was a whopping 9” lower than the Porsche in height. The car weighed 840 kgs distributed 40% front and 60% rear. Top speed was 131 mph (210 kmh) and 0-60mph time around 8 seconds. The Alpine’s engine was derived from the R16’s 1,565cc I4, and was released in three variations. From 1971-73, the 1,605cc VE series featured twin 45 DCOE Webers putting out 125 hp (93 kW) at 6,000 rpm. April 1973 saw the introduction of the VF series, with the Webers being replaced with Bosch D-Jetronic fuel injection increasing power slightly to 127 hp (95 kW) at 6,450 rpm – a changeover made to meet tightening emissions standards. This same engine would make its way into the R17TS/Gordini from 1974. In late 1975, a detuned VG version was released with a 1,647cc engine fed by a single 32 Weber for 95 hp (71 kW). All were mated to a 5 speed manual gearbox except one VG fitted with an automatic. Across the life of the A310, there would be very little change made to the body. In August 1973, the NACA ducts on the front wings were moved forward from their placement near the windscreen towards the leading edge of the car. This occurred in the midst of the 6 month period when the VE and VF versions were both in production, so this change does not actually denote either model specifically. Factory-supplied images suggest this coincides with the headlight mountings changing from body colour to black, but given the hand-assembled nature of these cars that may have been an option. Under the skin, the front axle balljoint mountings were changed in 1974 to silent-bloc rubber/steel bushings. Though the steering rack was taken from the Peugeot 504 and the front turning signals from the Simca 1301, most of the components came from the Renault parts bins and would have been subject to any changes in specification or supply. I’ll leave it to the bien informés to point out any other modifications during the A310’s life. The 2+2 cabin was a step-up in luxury for the marque, with electric windows, carpet and optional leather offered by Alpine for the first time. The massive rear transmission ‘pyramid’ intruded significantly on the +2 seating, though it was not as cramped as some competitors. There was a 180+ hp version of the A310, but it wasn’t available to everyone. A dozen A310s were prepared for competition with front wheel arch flares and a widened rear flank that included most of the c-pillar to also allow for larger air intakes. Designated the VC model, it had a 1,798cc engine that was unfortunately never an option for the road cars. But the A310 was not the competitive sibling in the family. It was over 200 kgs heavier than the A110, and with both using the same engine it was the two seater that continued to excel. Using A110s, the Alpine team won the World Rally Championship in 1971, and the car continued to notch up national titles for its various drivers through to 1975. The French police, or more specifically, the Brigade Rapide d’Intervention de la Gendarmerie, continued with tradition and had a small fleet of A310s; numbers quoted vary between five and seven. Most were VF models, but I don’t think the engines received any further tuning. However the cars were required to handle pursuit tasks, and they earned spoilers front and rear. Perhaps the most unique facet of the police-spec A310s was that the fibreglass body had metal flakes embedded in the resin to aid radio reception. These cars also had a metal plate inserted in the cabin roof for the same reason, as well as serving as a Faraday cage. Note the example lower right with the louvred rear window. The louvres were available very early in the A310’s life but soon fell out of French regulatory compliance probably because of rear visibility issues, which makes their presence on the police cars even more interesting. They were apparently available for foreign market cars. The A310 was sold in Belgium, Italy, the Netherlands, Germany, Switzerland, Spain, Mexico and Portugal – which combined made up almost 50% of sales of the model. There was no RHD version, which meant the UK and far-flung Australia missed out. Build quality on the A310 was not great. Rédélé had committed to a new Dieppe factory in Bréauté Street that became operational in 1969. The capital outlay was significant for this largely independent carmaker, and the A310 had been rushed into production to help offset costs. Adding to Alpine’s woes was a workers’ strike in 1972. In 1973, Jean Rédélé sold a controlling interest in Alpine to Renault, though he remained involved with the marque. Whether this agreement was made before or after the October 1973 announcement of the OPEC oil embargo, Renault and Rédélé watched as sales of the A310 halved in 1974. Production peaked in 1973 at 666 units, and never again breached the 350 figure. In all, only 2,340 A310s were produced. The Alpine was not a cheap car. Its 1973 home market price – 46,800 Francs – was almost double that of the Renault R12 Gordini at 19,200 Fr, and was still substantially higher than the top-spec R17TS at 24,600 Fr and R15TS at 18,500 Fr. At its sticker price, sales were probably impacted by the fact that some buyers were waiting for the V6 version. In 1971, a joint venture was established between Peugeot, Renault and Volvo for a large (in European terms) engine built at Douvrin in Northern France to be used primarily in each manufacturer’s senior saloon. Originally planned to be a V8, ambitions were soon changed and what emerged was the PRV V6. In 1972, only a year after they had delivered the factory prototype, Coggiola presented another A310 body to Alpine. Perhaps mindful of the larger engine on the horizon, or of criticisms regarding cabin space, this proposal was 3” taller, 6” wider and 8” inches longer than the standard A310. It had also gained 3” in wheelbase. Trevor Fiore was still involved with Coggiola around this time. At top left is his 1973 Opel-based Sylvia prototype built by the carrozzeria. However, this shape looks to be the work of Aldo Sessano, of Bocanegra fame and who had also penned the Lancia Fulvia-based 1971 Coggiola Dunja seen at bottom left. The proposal was only a plaster styling mockup, but it remained with Renault for a year as they considered whether to proceed with it. There was another special-bodied Alpine that some had originally presumed to be based on the A310. It was the work of French stylist Denis Meyrignac and was shown at the Geneva Motor Show in 1977. It was actually built over an A110 chassis and engine bought directly from the factory, and intended for small-volume production. However Meyrignac blanched at the costs of pollution compliance (despite the fact that the Alpine engine already complied) so the project was abandoned. 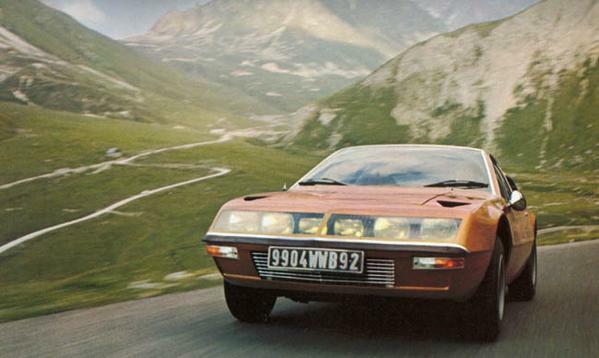 It’s not clear whether one or two examples were produced – the red Geneva Show car apparently housed a V6 – and this audacious shape ended up being test driven by a French motoring journalist anticipating the helmet-chic of Daft Punk before the Meyrignac Alpine found its way into long term storage. With Renault now in control of Alpine, the task for shaping the A310 V6 fell to Robert Opron, seen here at right with his predecessor (now staffer) Gaston Juchet and Bertone’s Marcello Gandini. There were a few prototype bodies built bearing much resemblance to the Citroen-controlled Maserati Bora and Merak in their flip-up headlights, flying buttresses and rear-end treatments. Peter Stevens had been directly involved with the Alpine for the introduction of the V6 model, launched in late 1976. The neat chin spoiler did not detract from the shape at all, and in fact looked a natural fit with its complementary angling and surfaces. The same can be said for the small window-width rear spoiler which gained ‘Alpine Renault’ lettering in 1978. The NACA ducts up front were gone and the rear lower panel was now blacked out, with new light units. Most significantly, that distinctive front end was revised to a four-headlight arrangement, divided by body panelling which sported the Renault logo. The spotlights were now placed under the bumper beneath the turning signals. 1977 would be the last year of production for the venerable but glorious A110. A winner to the end, it bowed out with its head held high. But the star of the show was the V6. Production of the four-cylinder VF had ceased in April 1976, but the detuned VG (also known as the TX) was built for another three months. It’s listed in the 1977 World Cars catalogue alongside the V6 but when you compare the prices listed; 76,900 Francs for the 95 hp A310 TX, and 77,900 Francs for the 150 hp A310 V6, the senior model seems like a bargain. It had a top speed of 137 mph (220 kmh) and could reach 60 mph in 7.5 seconds. The 2,664cc V6 engine was fed by a single throat Solex 34 TBIA and a double-throat Solex 35 CEEI carburettor. Suspension was derived from the R30 saloon and the vehicle weighed-in at 980 kg (2,161 lbs). The heavier engine altered the A310’s weight distribution, now at 33% front and 67% rear. Of course this affected handling and Renault found themselves sending updates to dealers explaining how to set rear tyre inflations for the first series of the A310 V6. In 1978, the ‘Group 4’ option was introduced, featuring the body kit from the Heuliez concept car of 1977, albeit with smoothed wheel arches rather than the bolt-ons and minus that fantastic spotlight binnacle. The engine was the same as the standard model, but it came with a five-speed box and wider wheels. 30 examples were produced. If it was more power and even wider flares you wanted, then you needed to find yourself the 270+ hp Group 5 version. With the A110 gone, the A310 was initially the steed of choice for Renault’s gravel track ambitions. A Group 4 A310 V6 putting out about 240 hp won the 1977 French Rally Championship in the hands of Guy Fréquelin, but Renault’s competitions focus would soon shift to the mid-rear engined turbocharged versions of the R5. Series 2 was introduced in 1981. Upgrades on the exterior included wraparound bumpers and larger wheelarch flares. The 4 stud wheels and rear end suspension were now derived from the R5 Turbo – which significantly influenced its handling for the better. The same version of the V6 was carried over but was now mated to a 5 speed. The wording on the rear spoiler was flipped to read ‘Renault Alpine’. The ‘Group 4’ option became the ‘Pack GT’ for Series 2, though it seems to have had different names for different markets; ‘S’ in Germany and ‘F-Pack’ in Japan (!) There was also a ‘Pack GT Boulogne’ featuring the 2,849cc version of the PRV breathing through 2 triple throat Weber 46 IDA carburettors and producing 193 hp (144kW). Only 27 Boulogne were built. Towards the end of its life, the standard A310 V6’s price has risen considerably. In 1983 it was offered at 131,000 Fr and that rose to 140,880 Fr in 1984. But despite this, the A310 V6 was Alpine’s greatest sales success. Except for its first and last (half) years, annual production never dipped below 1,000 units. When the last A310 V6 rolled off the production line in 1984, 9,276 examples had been built. But what of its replacement? In 1977, this A480 styling mockup was prepared as part of an attempt to create a ‘1980’ language for an Alpine in mid-rear engined configuration. This shape, possibly by Gandini, seems to have come to nothing. But it does indicate an expectation that the Alpine visual language might have to move on. In 1981, Yves Legal produced this sketch. It was much closer to the A310, but bearing a new body particularly at the rear. The A310 replacement was again an Opron-headed task. Heuliez was asked to help prepare the prototypes and the further the project progressed, the more it returned to the A310 shape. This was not necessarily a matter of economical panel sharing; whereas the A310 body had been cast as a single piece, the GTA was to comprise a multitude of small body panels in fibreglass and plastic bonded together and to the chassis making it effectively a monocoque. The 1985 Renault GTA was 6” longer, 4” wider, 2” taller with a 3” longer wheelbase than its predecessor. The A310’s shape had translated well into the 1980’s and the narrow-bodied version of the GTA was able to boast a Cd of .28. The most significant visual difference was the see-though c-pillar treatment but detail changes were made everywhere. The backbone chassis arrangement was retained but this was a new car. It was available with two versions of the PRV engine, the 2,849cc, 160 hp GTA and the 2,458 cc, 185 hp GTA Turbo. In 1987 the GTA was prepared for the US market with unique flip-up headlights. 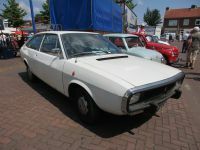 However, because of Renault’s stake in Chrysler-owned American Motors, the GTA was quickly withdrawn due to competition with Chrysler’s TC by Maserati. Only 21 examples were made. 1990 saw the GTA Turbo Le Mans released in the home market, with a revised frontal treatment and flared wheelarches. Performance specialists Danielson developed aftermarket tweaks taking power up to 210 hp. In 1991, the widenend body of the Le Mans model received flip-up lights for the 2,975cc, 250 hp version, renamed A610. The GTA/A610 range was considered a failure for Renault, it was a far more refined vehicle than the A310 but only sold around 6,500 models over its ten year lifespan against greater expectations. Though this was a veritable road rocket, it was also the A310 shape at its most anodyne. The final A610 was built in April 1995. For 1996, Renault would be referring further back into the Alpine heritage. Though comparisons can be made with Porsche and Lotus, I find the most direct analogy for Jean Rédélé to be Carroll Shelby. Both started as successful drivers then went on to create exciting niche vehicles for road and track, and by dint of their accomplishments and their agreeable, charismatic personalities, their names strike an impassioned fervour amongst their compatriots. In 1977, Rédélé sold his remaining stake in Alpine to Renault. He stepped away with a promise from Renault that they maintain production in Dieppe for the next fifteen years. In 1976, Renault Sport was formed to take charge of Renault’s racing activities. It was based out of Alpine’s Val Druel facilities and they soon scored big, with outright victory at the 1978 24 Heures du Mans in an Alpine A442B, earning themselves a tow down the Champs Elysees. 1976 also saw the release of the Renault R5 Alpine. 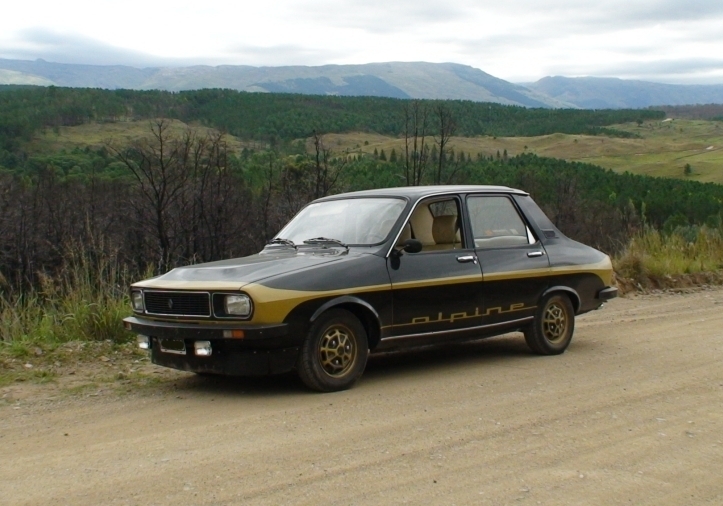 This performance variant of Renault’s bread and butter baby had been developed by the Alpine team and sold 53,000 units. In 1978, Renault Sport was moved out of Val Druel, and in its place Renault established Berex (Bureau d’Etudes et de Recherches Exploratoires) to develop sporting variants of Renault’s road cars. What soon emerged were increasingly lairier versions of the R5. The Alpine nameplate has been used sparingly by Renault. Its application can be somewhat problematic. For one thing, it was not able to be used in the UK due to Rootes, then Chrysler, having their own claim on the name. But it’s a bit more complex than that. Though the Alpine name is held in high esteem by aficionados, there is limited global understanding of what it stands for. Compounding the issue is another highly esteemed French brand owned by Renault – Gordini. Whereas ‘Gordini’ seems more appropriate for performance variants of standard models, ‘Alpine’ requires a slightly weird body as well to really make sense of its brand equity. Thanks to its presence in the Gran Turismo computer games, Alpine has been able to stay relevant to a younger generation. And Renault has recently made efforts to revive it in the real world. So there’s still hope. A couple of years ago, fellow carspotter AVL wanted to show me an exotic he had found in Melbourne’s backstreets. It was the weekend of the Grand Prix, so we jumped on our bikes to avoid the traffic and roadblocks, and when we arrived I couldn’t believe what he had led me to. This example is one of only four in A310/4s in Australia. In 1991, it was apparently brought over from the French island colony of New Caledonia. Back then it was restored to its original gris metalise colour and was converted to RHD, but it had lost its original VF motor and gearbox. At some point something must have been difficult to replace or fix, and it was left parked out in the street. By the time I caught it, the fibreglass body had withstood the ravages of its outdoor storage but it was looking most forlorn. It has since disappeared, hopefully still held in Australia and afforded the rejuvenation it deserves. The argument can certainly be made that the first series V6 is the best-looking A310. But for me it’s the four-cylinder body. As pure automotive sculpture, I prefer it over the down-force appendaged later models. The final clincher in its appeal, however, comes from those six lights behind that full-width plexiglas panelling. Like the bittersweet dissonance within “ polnareff’s ” or the astringent edge of pastis, that slightly jarring face is intrinsic to the authenticity of the A310 shape. 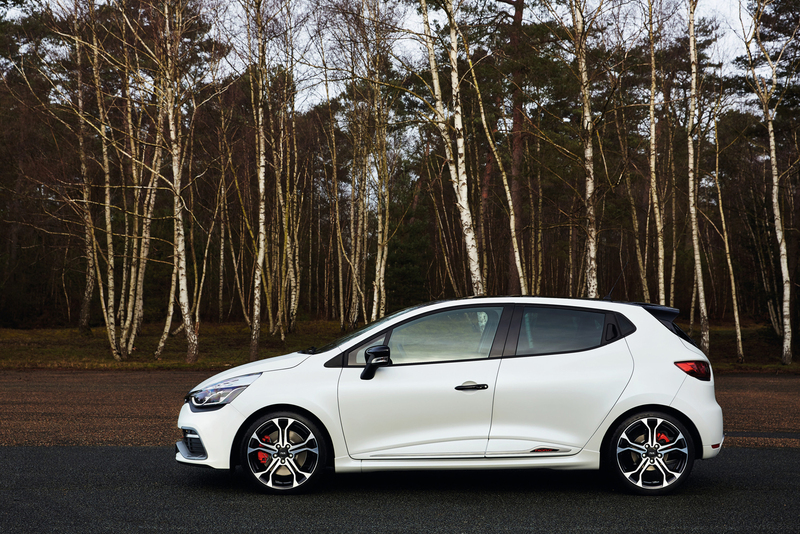 Renault literature credits only Michel Béligond and Yves Legal for the styling of the A310. Trevor Fiore’s involvement has never been fully explained, though there is a recent book ‘Alpine La Passion Bleue’ by Bernard Sara that apparently addresses this. Unfortunately it has only been published in French and I have not been able to access a copy. If any of the CCommentariat have read this book, I would greatly appreciate their input. As to Gaston Juchet’s contribution, that is only a guess on my part. Whatever their roles in the creation of the Alpine A310, the shape that emerged was one for the ages. of Jean Rédélé and the Alpine years to the mid-1960s. Cool cars I’m sure Ive seen a A 310 at a show in Aussie nothing else looks like that I saw a A110 in Havelock north here in Hawkes bay at the end of a Dunlop targa it had been competing beautiful car and very rare here, Vauxhall copied the faired in lights of the 310 for their Firenza droop snoot coupe, but awesome cars and a great write up Thanx Don. Opel/Vauxhall payback for this Interlagos prototype? The A110 rally cars are probably my second favorite race cars, behind the GT40, but I never knew that much about the company’s history. Additionally, I think I’ve always been biased against the A310 because of the ’80s version of it and the fact that it wasn’t an A110, but the four-cylinder is a beauty. Excellent ! Or as the French say: Excellent ! Your comprehensive high-quality articles are like a work of art. Don also mentioned Juchet’s R15 and R17. A few weeks ago I spotted this 1971 Renault R15 TL. Must have been a few decades ago since I saw one on the road. Great find. Superclean which is how these need to look. I prefer the 15’s glasshouse, and thank goodness they both got the loop bumper. Beautiful post with great pics. I was vaguely aware of the Alpine cars, but learned a lot this morning! Great piece on a brand I did not know much about. It is ashamed that the Gordini V8 did not work out. It may be a case like the Lotus Espirit where you think you need the bigger V8 engine until you finally get one and then not so much. The later V6 being 90 degree brings it’s own compromise. You did a great job of explaining how Porsche introducing a 6 caused competitors to up their game. The interior shot looks very inviting with that great 70s color matched euro velour. The leather looks boring in comparison. Thanks John. It’s easy to take Porsche for granted these days, but back then they were just a smallish concern as well. They just managed to get almost everything right. There was one very big difference: Porsche was very successful in the US. IIRC, Porsche was selling like 70% of its cars in the US in 50s and early 60s. Or at least half. The US was critical to Porsche’s success. Alpine? A handful of A110s? Porsche and Ferrari benefitted from Max Hoffman and Luigi Chinetti who both knew how to market to the US, just as Mr K. figured it out in the late 1960s with the Datsun 1600. But the cars were good anyway. When you consider that the Dauphine was at one stage the biggest selling import into the states, the market was sort of ready for Alpine. A bit off-topic, But the Dauphine’s sales surge in the US (1959) was quite short-lived. It really wasn’t ready for US conditions, and by 1960 its sales plummeted, unlike the VW’s. The Dauphine simply wasn’t up to US-style driving and (low) maintenance conditions. And they were terrible rusters. I really can’t see the Alpine riding to any success in the US on the back of the Dauphine. Quite the opposite; the Dauphine quickly became an icon of a “lemon” in the US. VW and Porsche both had relatively low-stressed and well-developed engines that were mostly bullet-proof, even in the hands of Americans. Also, the Porsche had a cabrio and Speedster, which were extremely popular in the important California market. And the Porsches (except the Speedster) were eminently usable as a daily driver, with no compromises in comfort, ride, seating, etc.. I really can’t see the Alpine having anything other than quite limited success in the US in the best of circumstances. 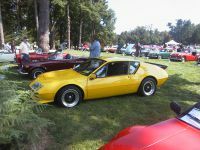 The mass-market sports car market was utterly dominated by rag-tops, which explains the failure of the TR7, as most Americans who had a sports car were either young or had a second car. The Alpine would have appealed only to hard-core racer-types, and that market was weakening throughout the 60s. You’re right. Added to which is the fact that most of Alpine’s competitions success was in rally and rallycross, which I don’t think had as strong a following as amateur trackracing in the US. Wow Don, very nice piece, very accurate and detailed, you even mention the R12 Gordini. 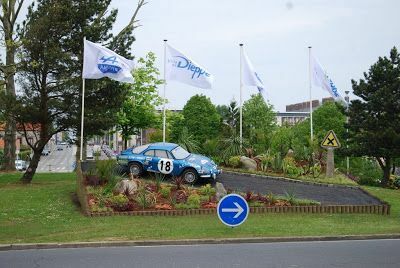 Today, if you enter “Álpine-city” Dieppe there is a mock up of an A110 body at a roundabout. Excellent history of an – at least stateside – underappreciated marque. The A310 always struck me as a neat car, sort of a cross-pollenization between a Lotus Europa and TVR Tasmin and now, after reading the background on the design, I understand why. European auto design of that era really was quite incestuous, everyone seeming to work with everyone else for some limited period of time. And I’ve always loved the A110, neat to see how the shape progressed, gradually getting longer and lower. All in all, the best thing run here in a long while. Merci beaucoup! A really wonderful piece. I must have seen an A310 at some point. I’ve certainly seen the lovely A110s – French racing blue, of course – both on the road and in competition. Well done, sir! Very interesting post. I always loved the four-cylinder Renault 16TS powered A 310’s. An 110 is too cramped for me, and at the time the 310 was what the 928 was for Porsche: a logical step up the ladder. The impressive front of the early A 310’s with their six headlights, the alloy wheels, the interior, it all made it a very desirable car. You can see it suffered from its small engine displacement, like Lotus in those days. When the V6 came on the market quite a few were sold here in the Netherlands, where you would never meet an A310 4 cylinder nor an A 110 in this country except a few that we used for competition only. The A 310 V6 was an alternative for the 911 Porsche I guess. The V6 even had quite a big following in Germany and thanks to the glassfibre body many an A310 has been modified to give it Group 4 looks. But pour moi, the light version, the fragile one, the four cylinder. Any of you guys want to take a Renault R8S in p/ex? I’d say this kind of stuff is worthy of being published in the Christmas special of ANY quality car magazine, this is quality stuff I love to read during the holiday season, the pictures the back ground information, everything ! Great article! Nicely done. I always liked the looks of the Alpines, and at least bought a Tamiya A110 RC kit to add to my collection. I found this pic during my research. I don’t think it’s doctored, I think it’s a genuine kiddyscale sports prototype. I have always had a soft spot for the Alpines, especially the A110, with the A130 close behind. But I’ve never really read a comprehensive history of the marque, and this was absolutely perfect. It’s as good as anything I’ve ever read back in Automobile Quarterly’s heyday. I savored every paragraph. I was barely aware of the A106, and I find its rear quarters a foreshadowing of the A130’s. I do like the A130’s design for the most part, especially in profile, but I can’t reconcile myself with its rear end. It look bulbous and ungainly. The versions with slats and rear spoiler help, but the bare version is a problem for me. The connection with the Hai is a revelation. I had seen the similarities, although the front ends are rather different. But I just assumed that “it was in the air”. Thank you again for this superb addition to our pages. That’s extremely flattering Paul. It helps having an editor who knows his stuff backwards. Thanks for the Ledwinka headsup. To me Renault has always brought visions of the 4cv or R5. AMC added to that with Le Car. No more. Now I will think of some of the pictures above. Extremely disappointing. While I agree that it’s not up to the visual level of the A310, the GTA is still quite an attractive car, and (especially with the turbo) quite a performer. To lose that for a LeBaron convertible in an ill-fitting Italian suit is just wrong. I never realized that even a small run were actually sold here though. I’d love to run across one curbside one day–a man can dream, right? Nice to see a picture of the Renault 5 Alpine. It was introduced just before the VW Golf GTI. Fast forward 40 years, the VW Golf Mk1 GTI evolved into the VW Golf Mk7 GTI while the Renault 5 Alpine evolved into the Renault Clio Mk4 RS 220 Trophy. The Clio with a 220 hp engine below, although an even more powerful version is in the works. No one can beat the French, that’s Renault and Peugeot, when it comes to B-segment hot hatches. I always had a soft spot for the A310, I thought it was a cool looking car. I’ll be honest, French cars have often left me cold, they just don’t look interesting and the ones that are more out there, tend to be a mish mash of design choices that fails to find a coherent shape. But, when the French get their out there styling just right, they hit it out of the damn park. The 310 is a very out there car, but it’s like the Citroen SM, there’s something about it that clicks together and the result manages to be unique as well as good looking and memorable. I like the A610 as well, I just thought it didn’t look as special as it’s predecessor. This is the most understated puzzle piece of this whole article. Alpine and Renault wanted the A310 to be equally successful on the rally circuit as the previous A110’s, naturally. This, however, was overshadowed by several factors. For one, the A110 was primarily conceived as a tarmac rally terror, with the gift of high traction via it’s rear engine layout. Yet it took nearly no time at all to find out, this same layout in combination with thicker, heavier fiberglass panels in calculated places, along with increased ride height made it nearly as effective on loose and/or rough surfaces. The A310 did not share in the benefit of this dual personality, due large in part to the greater heft it carried around to begin with. Then there is the issue with how the FIA required a car to be properly homologated to compete within the International level; where as French events were lax in this regard, the majority of other sanctioned events were not. This problem was not unique to the A310, as the A110 faced similar hurdles over the years. The A110, however, had overcome most of these barriers via proper production runs by the time the A310 began competition within the rally circuit. 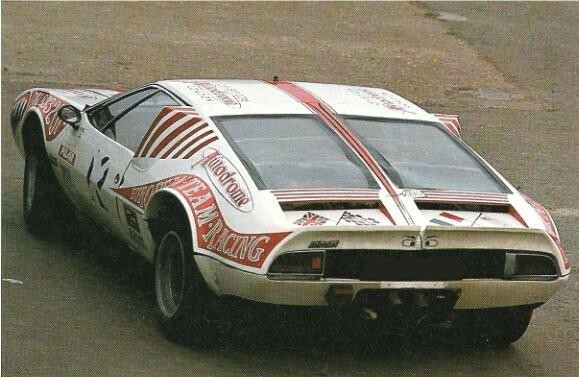 Initial competion using the A310 proved it to be equally as fragile as the early A110 series cars, and a new predator was also lurking about in semi-homologated state at the same time; the Lancia Stratos. Long story short, the 4-cylinder A310 works cars were miserable failures. Not only were they underdeveloped, they also now had to work around a Renault budget that was also attempting to win with R17 rally cars and Formula One ambitions. Outside of the 1st place finish on the 1975 Rhonde Crevenole, 3rd place was the next best thing these cars could muster (all on French events). Renault thought the development of the V6 A310 in 1976 could possibly defeat the Stratos; Wrong. Faster at the expense of more rear weight bias, It took Group 5 homologation (which was not FIA WRC sanctioned) to slightly better the power of a Group 4 Stratos. Renault therefore was stuck targeting the French Rally Championship as a last resort, which it eventually won in 1977. Renault immediately halted further rally funding for the A310 at this point. Renault has attempted to bury a lot of the rally competition development history of this car as a direct resultof it’s failure. I also find it quite interesting to note nobody in the rally world has claimed to even enjoy the A310 during their careers, yet Jean-Pierre Nicolas, Ove Andersson, and Michelle Mouton all claim one variation or another of the A110 to be their absolute favorite competition car, ever. The nub of the problem seems to sit with the fact that this new Alpine car was originally planned around the 3 litre V8, which – to best of my knowledge – was cancelled during the development of the A310. From that point on, the car was compromised as a thoroughbred. One interesting point about the Stratos and Renault. According to Aaron Severson’s piece, the mid-rear engined R5 turbo came about as a Stratos-beating suggestion from Bertone, who themselves had created the Stratos. There is more to that story than meets the eye; if it weren’t for a very snowy 1978 Rallye de Monte-Carlo, we likely would have never seen such a beast. Second place was taken by Jean Ragnotti in a Group 2 Renault 5, ahead of several Stratos’ and Abarth 131’s. It got people thinking Small could be More. Walter Rohrl was even passed on the road by this 5 without him going off! Renault, after dumping the A310 from their rally program unceremoniously, immediately switched their attention to these 5 Alpines. After such a spectacular showing on the Monte, it is not hard to see why they would delve further; these cars maybe shot out 150 horsepower max in rally tune. Also of significant note is that another of these “weakling” 5’s took second place in the 1979 Tour de Course, driven by Ragnotti once again. Just as an aside, have you considered writing a piece for CC? Even if you don’t have any curbside classic pics (though there is the cohort), I’m sure you could put together a pretty good Automotive History on a subject of your choosing. Go for it. If you need any help, contact Paul through submissions and if he’s busy I’ll give you a hand. But it doesn’t sound like you really need it. Wow Don, when I clicked the post I wasn’t prepared for how detailed and in-depth it would go into all of Alpine’s history, a fantastic read! I saw it yesterday and then held off reading it, today I happened to take pix of a Maserati Bora and when I got home saw the post again while thinking the A310 does look somewhat Bora-ish, interesting to see the same conclusion in the text. Anyway, another brilliant and informative read, thanks for taking the time to do this one, that was one rare find well worthy of a write-up! I can`t possibly add anything new to the comments, so I`ll just give this article an A+. Thanks Don. Wow! The facts, analysis and with pictures – all on a little known marque. Amazing how you did that. I’ll be rereading this in the near future. During the most of 1970s and early 1980s, many small manufacturers of exotic cars often sift through the components made by OEM suppliers to peruse on their cars, i.e. taillamps, BBS gold alloy wheels, Recaro seats, etc. That’s why some of design elements didn’t really harmonise with the entire design or some design compromises were made. One item in the pictures above jumped out: Tornado mirrors. 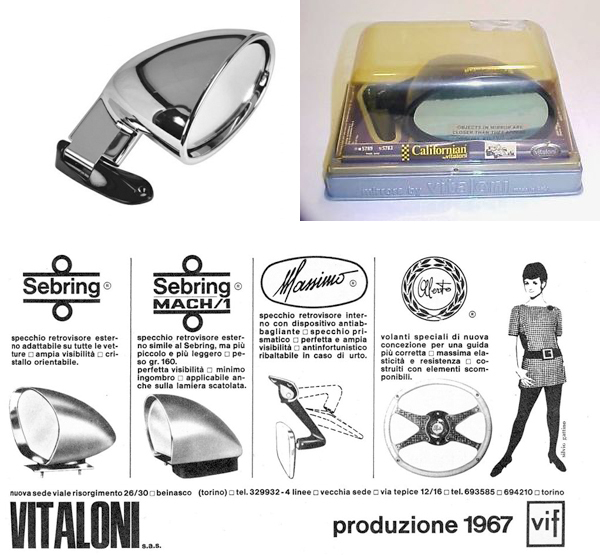 I had those mirrors installed on my 1971 Alfa Romeo due to the driving laws in Texas, requiring the deaf drivers to have both left and right external mirrors. I’m not sure where the early ones were sourced. What an incredibly detailed and insightful look into a significant series of sports cars that I knew only from sporadic coverage of the A110 in American car magazines. I have been fascinated by the A110 for a long time, as a sort of mini-Porsche 911, but the long Alpine lineage before and after the A110 is something that I knew nothing about, and I did not know even where to start looking. I think that you have answered all of the possible questions about it. Only one question comes to mind: is the A310’s nose possibly the inspiration for the Vauxhall Firenza “droop snoot” introduced in 1973? There is a definite resemblance there, although not anywhere else on the two cars, and 1971 to 1973 is more than enough time for the A310’s styling to have been reviewed and re-used by GM’s stylists in the UK. It would have a sort of latter-day Dieppe Raid. Thanks Robert. Bryce made the same observations re the Firenza. According to Vauxpedia, the droopsnoot first appeared in June 1972 within the styling studio. The ‘Black Knight’ (top) was the first attempt at a slant nose, and the ‘Daytona’ (based on stylist Wayne Cherry’s Ferrari Daytona) came soon after. 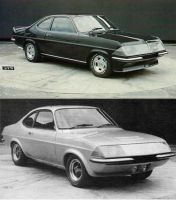 These appeared in studio after the A310, but the normally well-informed Vauxpedia site claims the Firenza influenced the A310, despite the A310 being seen as early as March 1971 and on the road by October that same year. So it seems possible the ‘suggestion’ came from France. Don, c’est magnifique! Adn the car’s not bad either. Like you,m Id go for the 4 cylinder, on thew basis of the front and presentation of the lights, and the GTA is now looking a bit too 90s for me. I learnt lot there, and your knowledge of style and stylists comes right through. Thanks! I saw a Renault Sport Spyder, the 1996 aluminium car you show),recently, and you’ve reminded me to prepare a CC Outtake on it. And how cool is a country that puts louvres on the rear windows of police cars? Looking forward to the outtake on the Sport. The first examples came without windscreen, but by the time it reached the UK a windscreen had been added. Great find and a magnifique article Don! It is interesting to see those early Rédélé coupes and compare them to the contemporary 356. Also the A110-A310 transition is similar in many ways to ‘growing pains’ experienced by Lotus with the move from Elan/Europa to Elite/Eclat. It is interesting that Porsche were make the move to the 911 (with its completely unique engine) and grow significantly while Lotus and Alpine were not – as you said earlier the US market no doubt played a key part. Jim Klein touched on it, but looking at the later & hairier versions of the A310 reminded me of the Countach that also grew scoops and bulges as it developed. I have a real soft spot for the Alpines, and A310s in particular. A good mate through high school was the son of the local Renault (And Peugeot/Daihatsu/Subaru) dealer, so I was brainwashed a little. Probably explains why I like 205 GTIs as well. I recall a couple of A310s that used to do the Dutton Grand Prix rally back in the late 80s/early 90s, among the multitudes of more usual suspects. Perhaps johnh875 may be able to back me up on this one. But again, thanks for a great read! Thanks Brad. Perhaps you could flex your writing muscles with something for CC around the collection you attend to. Aha that would be where my grandfather got his Brumby utes from! 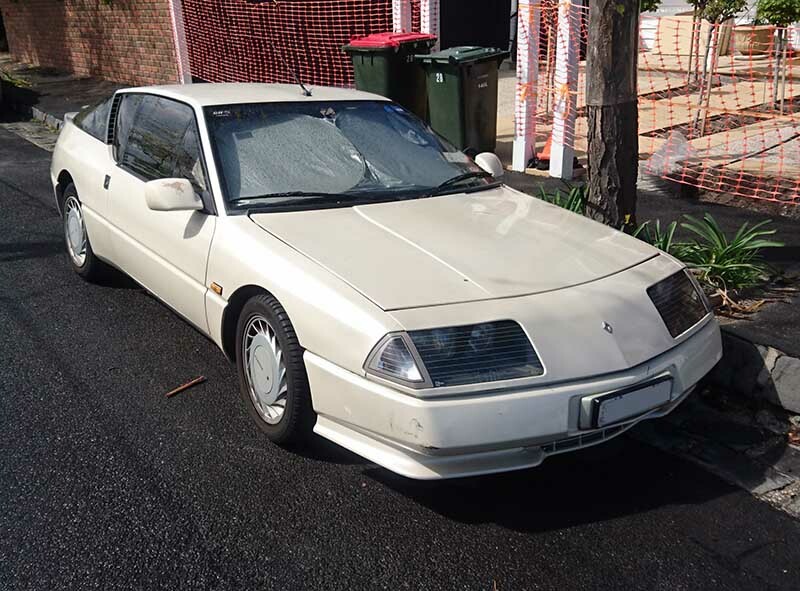 Probably also sold the 1994 or so Renault 19 to a relative that my sister ended up trading in for $300 when it was 10 years old; it had had a hard life! Earlier French cars were popular, being designed with an eye on conditions in the African French colonies. I don’t recall seeing too many Peugeot 205s in town though. I do remember occasionally seeing a couple of TVR’s (Grantura series 3 with the Cortina tail lights & Vixen) that would park out the front of Maddock’s garage in High St – if people have not seen them in person they really can’t understand how small they are! Don, what an absolutely fantastic write-up. Not only the A310 but the whole history of Alpine–just brilliant! The A310 is yet another example of a car that I read about as a child (in the UK-sourced “World of Automobiles” encyclopedia) and immediately fell in love with. The original six-lamp version is unquestionably the best–who else would design a look like that? Though I do also find the original V6 quite beautiful, and a better performer. But even the over-spoilered later versions are attractive, in a late 70’s sort of way. Plus the GTA/A610–I’m a fan of all of them. when i saw the photos of the monteverdi above i was immediately reminded of the detomaso mangusta. which came first? p.s. great article wonderfully researched and i loved all the photos. Mangusta, I can see. Interesting parallels between the men behind the names too. Haven’t seen that example before, those widened ducts look serious. Beautiful car Erik. Thanks for sharing. Thanks for the article Don. I spotted my first Alpine recently a Bathurst 1000 campsite, of all places. Cheers Chris. Recently caught this one in the backstreets of one of the bayside suburbs. There were plans for the Renault GTA to be powered by the 175 hp 2-litre Turbo engine in the Renault 21 Turbo, whether it would have also introduced the non-turbo 140 hp 2-litre version of the engine as an entry-level Alpine GTA though is another matter. Would have been fascinating seeing a version of the Alpine A310 powered by either a Gordini or PRV V8 as well as the 160 hp 1.4 Turbo from the rally focused Renault 5 Turbo. The Renault 16 engines were said to be capable of further enlargement to around 1774-1862cc (and would have made for an interesting 114 Project since the latter was to use inline-6 versions of the Renault 16 engine), one of which IIRC was used for rally versions of the A110 or A310 yet fortunately those displacements were never fully productionized as they would have been quite useful for a number of Renault and Alpine models including the RAG Coupe. Hi Don, I just spotted and read your great article. I was drawn to by a picture of a forlorn green A310 VF, which happens to be sitting in my shed right now. Its still due for a new coat of paint, but it revs cleanly to 7k once warmed up and gets out once a week on the unfortunately too short of a drive to work. They are an amazing little car, under appreciated and understood. Fantastic to hear its getting a refurb. Hope to see it around town.